Life expectancy would grow by leaps and bounds if green vegetables smelled as good as bacon.–Doug Larson (bacon quote). I am taking part in Foodie Friday which is a blog recipe sharing group. Look at the end of this post for links to more great recipes! We all love bacon right? I love bacon, my husband loves bacon, and my corgis really love bacon. Chocolate is pretty darn good too. Did you know how well chocolate and bacon work together? Vosges Chocolate makes a bacon chocolate bar that is pretty darn tasty, and I made chocolate covered bacon a few years ago that was a hit with a number of my coworkers. So, I decided to give bacon brownies a try. I adapted this from a Cooking Channel recipe. Obviously, this all starts with some bacon. Use 1/3 to 1/2 cup chopped, which is around 4 pieces fried up. If you are like me, you will fry extra just for a snack. 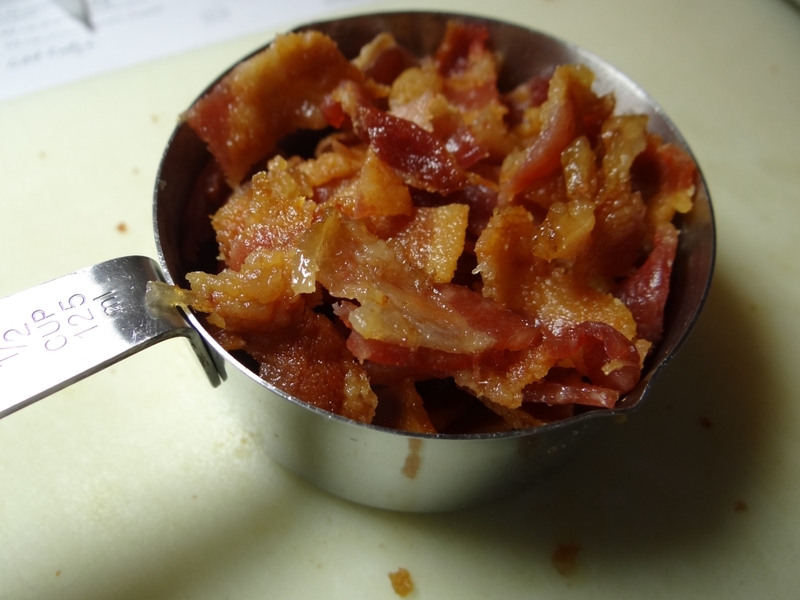 Here is my half cup of bacon. Of course I used a full half cup! This recipe includes chopped chocolate, which makes very fudgey brownies. I like them that way. The gooier the better! Heck, I would be happy with brownies that I had to eat with a spoon. With that said, if you like yours more cake-like, then leave out the chopped chocolate and perhaps increase the cocoa powder a bit. I also included pecans. You could substitute walnuts if you like. When you mix this up, it starts out like just about any other brownie recipe, but then you stir in all that extra chocolate, bacon, and pecan goodness. This would be a good time to treat yourself to some of that extra bacon that you cooked. Trust me, you will be craving it! Have a bite of chocolate too. 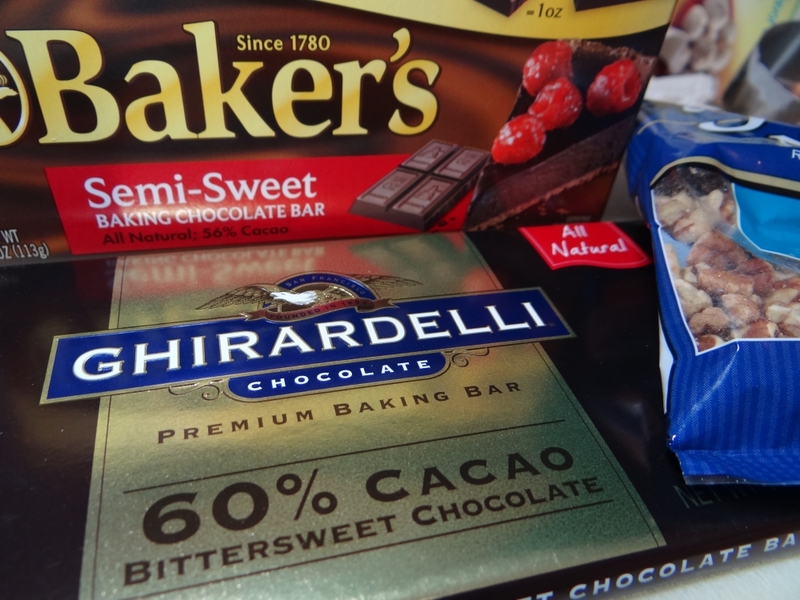 Then bake. Serve these warm with ice cream and a drizzling of hot fudge. The bacon adds just a hint of smoky and salty flavor that is simply awesome. 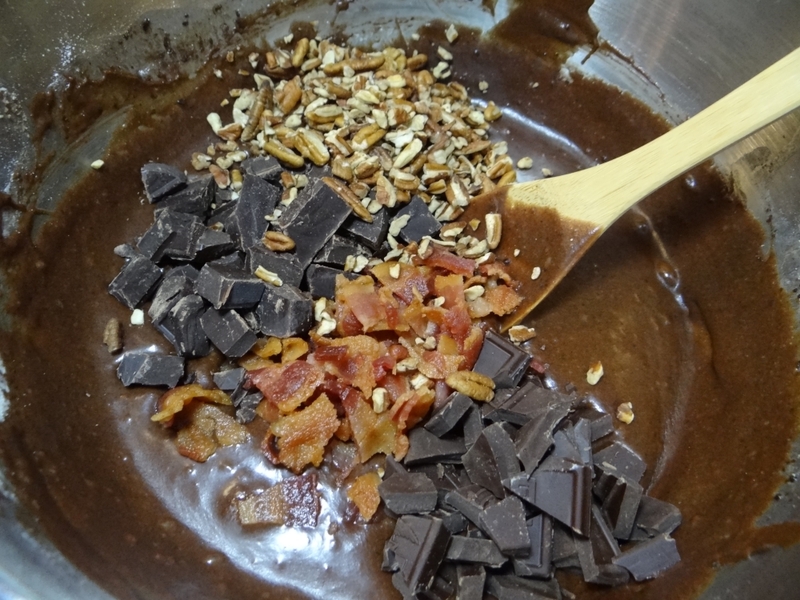 Bacon Brownies with pecans and chocolate. Awesome served with ice cream and hot fudge! This is part of a blog linkup, so check out the sites below for more great recipes! You definitely should try them. Bacon and chocolate are awesome together! You just made me drool onto my smartphone. These look delicious and I can just taste the yumminess right off the screen. Trust me, I was drooling the whole time I was making them! Really seriously! OH YUM! Bacon in brownies!!!! It truly is awesome. So is chocolate covered bacon! Is it bad I was drooling while reading this recipe, definitely one to try when this diet is over. YUM! Bacon + Chocolate…is there anything better? 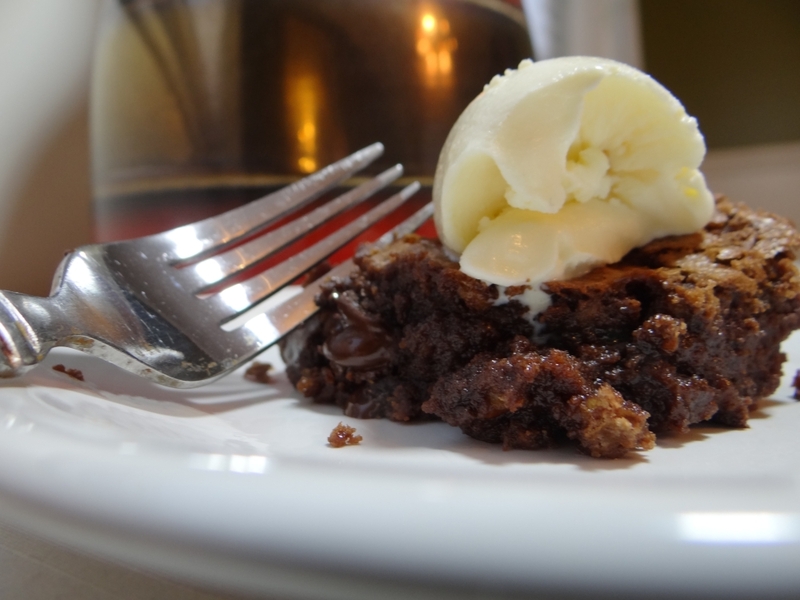 Oh, maybe inside of a gooey brownie! Yum! 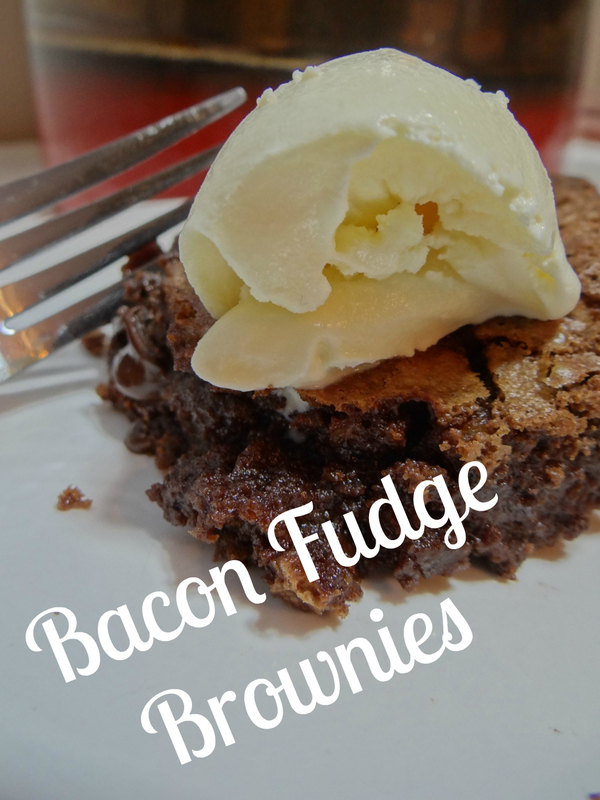 Yum, I love bacon and I love brownies. Looks delish!